Real-Time Bidding is a technology used to sell and buy ad impressions based on real-time auctions. RTB lets you maximize revenue from ad impressions, as the most profitable ad is automatically chosen out of all advertisers' ads. 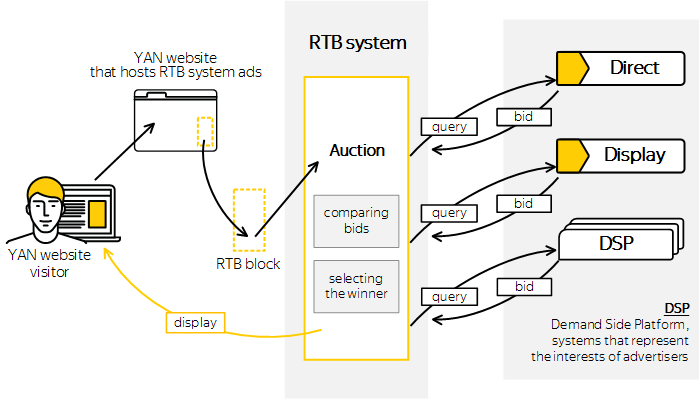 An RTB auction can be joined by any number of DSP systems. Currently several DSP systems are already connected to the Yandex RTB system, including those belonging to YandexDirect and the . Maximum profit from ad. The ad offer with the highest auction price is selected for each ad impression. The ability to set a price cap. On the ad platform, you can choose one of four traffic management strategies to receive ad blocks at the most profitable rates. Control over the list of advertisers. You can block ads from specific advertisers, and you can assign individual cost per impression thresholds for specific media advertisers. Regional display settings. If you want to limit RTB ad impressions for users from a certain region, you can set a specific CPM threshold. Complete traffic monetization. If an auction had no bids that exceeded your defined cost per impression threshold, your site can be configured to display ads from other banner systems, including your own ads. This means that you can realize the full potential of the ad platform at an optimal price. How cost per impression is determined for RTB blocks. How to create RTB ad blocks using our visual ad code designer. Available traffic management strategies and displaying your own ads in an RTB block. How to improve loading of the site's main content and ad blocks using asynchronous code.